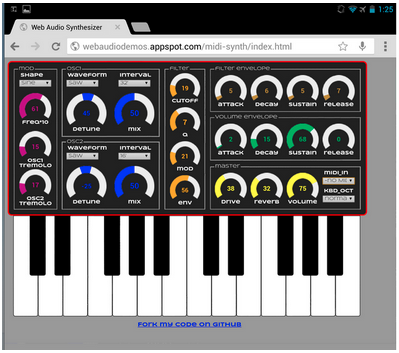 release introduces several new Chrome Apps APIs and a few exciting developer features on Chrome for Android. Unless otherwise noted, web platform changes affect desktop versions of Chrome and Chrome for Android. WebRTC enables real-time communication such as videoconferencing in the browser. It consists of three independent components: getUserMedia, which provides access to the user’s webcam and microphone; PeerConnection, which sets up calls with the ability to traverse NATs and firewalls; and DataChannels, which establishes peer-to-peer data communication between browsers. Today’s Chrome Beta channel brings Chrome packaged apps several new capabilities including richer access to Google services such as Google Analytics, Google APIs and Google Wallet, and better OS integration using services such as Bluetooth and native app communication. Read last week's Chromium Blog post to learn more. The resolution Media Query allows you to tailor your CSS to specific pixel densities. Chrome now supports the VP9 codec for WebM video playback. To align with the HTML spec, Chrome no longer allows cross-origin access to the window.history object. Chrome for Android now supports the color form input type as well as the min and max attributes for date and time input fields. XMLHttpRequest’s timeout property lets you set the number of milliseconds Chrome will wait for a server response. When the it expires, the request triggers a timeout callback. We’ve removed support for multipart/x-mixed-replace main resources. We will continue to support multipart images and animated images. Visit chromestatus.com for a complete overview of Chrome’s developer features, and circle +Google Chrome Developers for more frequent updates. We’re excited to see what you build! Today’s beta channel release introduces several new Chrome Apps APIs and a few exciting developer features on Chrome for Android. Unless otherwise noted, web platform changes affect desktop versions of Chrome and Chrome for Android. , today’s Chrome Dev channel release brings Chrome packaged apps richer access to Google services such as Google Analytics, Google APIs and Google Wallet, and better OS integration using services such as Bluetooth and native app communication. The Identity API allows packaged apps to authenticate users securely using OAuth 2.0 without the user having to provide a username and password directly to the app. The Identity API supports authentication using Google Accounts as well as third party providers such as GitHub and Foursquare. 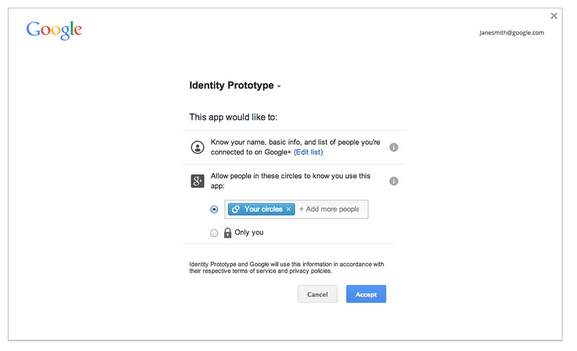 The Identity API also gives packaged apps secure access to Google APIs such as Google+, Calendar and Drive. As an example, Google Keep uses the Identity API to authenticate users as well as to call the Google Drive API to save notes to Drive. The Identity API uses a webview based UI to show the OAuth consent dialog and when the Google+ API scope is used, it allows users to control who can see their activity on the app. The In App Payments API allows packaged app developers to sell digital and virtual goods in a packaged app. The API is built on the Google Wallet for digital goods platform and provides a simple user interface for buyers. 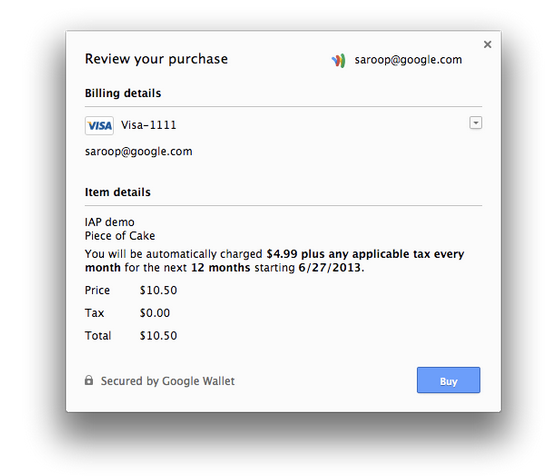 In addition to one-time billing, this API supports subscription-based billing. The Analytics API makes it easy for packaged app developers to collect user engagement data from their applications. Developers can then use Google Analytics reports to measure number of active users, adoption and usage of specific features, and many other useful metrics. The Media Gallery API allows packaged apps to read media (music, videos and images) from the local disk with user consent. Starting with this release, a user’s iTunes music library will be available as a default media gallery, allowing apps to import and play locally stored music. The Bluetooth API, based on the 4.0 specification, allows packaged apps to connect to Bluetooth devices such as smartphones and headsets. The API's Low Energy support allows Chrome packaged apps to automatically sync data from low energy health devices like fitness trackers and heart rate sensors. 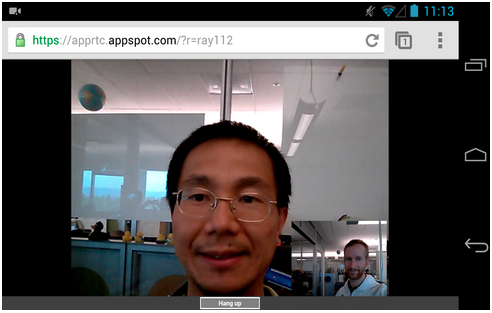 The Native Messaging API allows Chrome packaged apps to communicate with native applications. This API can be used by a Chrome packaged app to communicate with native binaries that drive consumer electronics such as motion sensors or scanners. During this preview period, packaged apps are available to Chrome Dev channel users in the Chrome Web Store. We've already seen lots of interesting packaged apps uploaded, and we look forward to seeing developers take advantage of these powerful new capabilities. We welcome your feedback on our G+ Developers page or on our developer forum. As part of our ongoing effort to bring powerful capabilities to Chrome packaged apps, today’s Chrome Dev channel release brings Chrome packaged apps richer access to Google services such as Google Analytics, Google APIs and Google Wallet, and better OS integration using services such as Bluetooth and native app communication.